Sometimes not talking about something that is bothering you right away is the best thing to do. There are people that will tell you talking about your problems right away is always the best thing to do, and that's the probably the worse piece of advice to give someone. Namely because we all process information and feelings differently. While some are able to process both together fairly quickly, there are some that can't move at that same speed. You have to know what works best for you and then move on from there. People need to stop giving advice based on experiences that they have gone through. That's the simple truth of things; you can't tell someone something based off how you're wired. Unless you know that person really well or that person gives you all of the details to a situation and how they are, (which people never do), then you can't really give advice based off that. This goes hand in hand with the same advice I give about relationships: know yourself and know the person on the other end of the situation. If you don't know them, or you don't really have a vested interest in their well-being, then don't say a damn thing to them about their situation. That's where a lot of people go wrong as well, they think they know enough to give unsolicited advice. Like they are the subject matter expert when it comes to all things bad so they feel the need to give advice that really doesn't make sense in the long run. The one thing that pains me to see is a person that doesn't understand their situation or what's going on and some idiot chimes in with advice that's not going to work out for that person. Too many times I had to sit back and listen to a person say something that sounds completely ridiculous and that other person eats it up. Right then, one idiot became two idiots. Sometimes I intervene and tell the person not to take that advice because it will have them up shits creek at some point. But that depends solely on the person, because if they're dumb as hell, utterly naive, or they just like drama and being miserable, I'll keep the tight lip quick. But that's only because it's going to be wasted energy in the end trying to explain to them why it's wrong and how they're being a idiot for taking their advice. You know how people do sometimes when you tell them they're being stupid for one reason or another; they get offended. And there in lies a whole other problem where that person could just not be that smart. It's sad to say that, but it's completely true. There's a world where people like to think that everyone wants to live the best life possible or they want to be in peace when that's the furthest thing from the truth. Sometimes those people like to wallow in that whole situation, and sad to say this, they'd like to make it worse simply because they don't have anything going on with their lives. And that's just how the world works in this day and age. I use to be one of those people that didn't mind giving advice to people because I thought that all people wanted to genuinely change and that they wanted to be helped. But once I saw that most people don't want to change and I learned that sometimes it's better that they sank or swim on their own accord to learn the lesson that needed to be learned. If not anything else that they are hard headed and they won't learn anything anyways from someone telling them directly what the consequences of a situation could be or how they could play out. So needless to say my advice to you is to, ironically enough is to only give advice sparingly and to the best of your judgement. Basically mind your own business and let people be if they are known for being an idiot. I know that you're suppose to help people in any circumstance but sometimes by trying to help them you are only making this worse than what they are. I've seen plenty of situations backfire like that and I've actually seen people get mad at me for saying I don't want to get involved because they want all of the attention that they could get. Like I said before, that's just the way the world is these days & it's a sad thing. 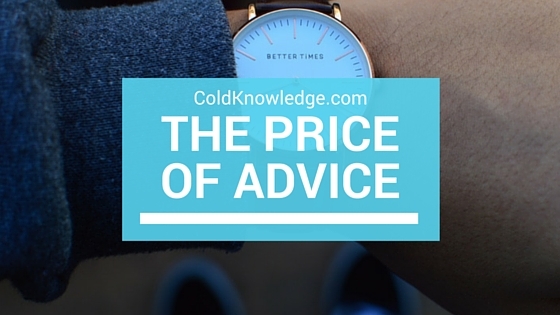 What do you think about giving advice? Do you think any and everyone is entitled to your wise words or do you agree in the sense that you should give it out on a case by case kind of deal. I would love to hear what you have to say in the comments section below.